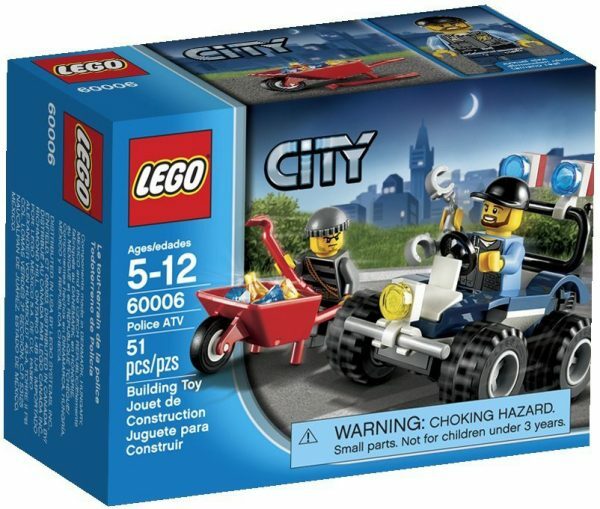 LEGO City Police ATV Only $5.35 + FREE Prime Shipping! You are here: Home / Great Deals / Amazon Deals / LEGO City Police ATV Only $5.35 + FREE Prime Shipping! Have a LEGO fan? Looking for a gift or stocking stuffer idea?! I have just the thing for you! Grab the LEGO City Police ATV for just $5.35 + FREE shipping with Amazon Prime or Super Saver Shipping! Accessories include wheelbarrow, crowbar, walkie-talkie set, handcuffs and 4 diamonds. Police ATV measures over 1″ (5cm) high, 2″ (6cm) long and 1″ (4cm) wide.